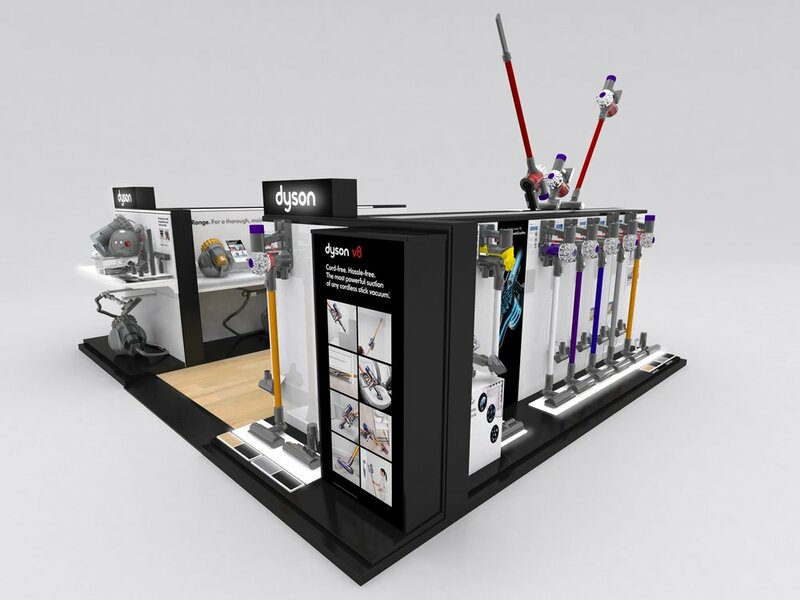 iDesign worked with Dyson Global to design and build a modular 50m2 Store in Store area showcasing and demonstrating examples across the Dyson range. The design required raised flooring tiles to be laid over a heritage protected concrete floor. A large rear wall with a 65 inch TV mounted into the front side and a full rear illuminated back wall, this area showcases the latest handstick range, with demonstration carpet area. It included ten modular adaptable plinths with pull out drawers housing demonstration units, including a “Supersonic” podium for hairstyling and a mobile IPAD display. This became the core design of the national rollout throughout Australia where layouts were made to suit different sized retailers and spaces. iDesign designed and manufactured the displays, project managing the installation in 400+ stores within a 2 week period in peak season. Pixalux® structural light panels were used to highlight the Dyson range. This was very successful with all products, drawing attention to key areas across the product range. Results included a 36% sales uplift over the promotional period with continued sales growth averaging 22% since installation. Feedback has credited the sales increase to the demonstration area, and brand visibility and location within the store. "iDesign is one of the best companies that I have ever dealt with from a creativity and 'on brand' perspective. 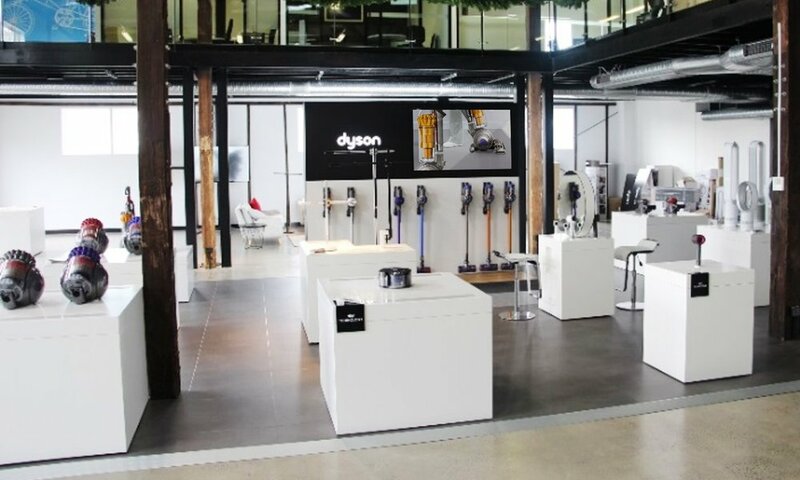 They understood Dyson as if they were a part of it, living and breathing Dyson and from a work scheduling perspective were always able to quickly scale up and down as we required more resources to maintain our workload." iDesign designed and manufactured displays across a range of retailers, each with specific in-store guidelines. 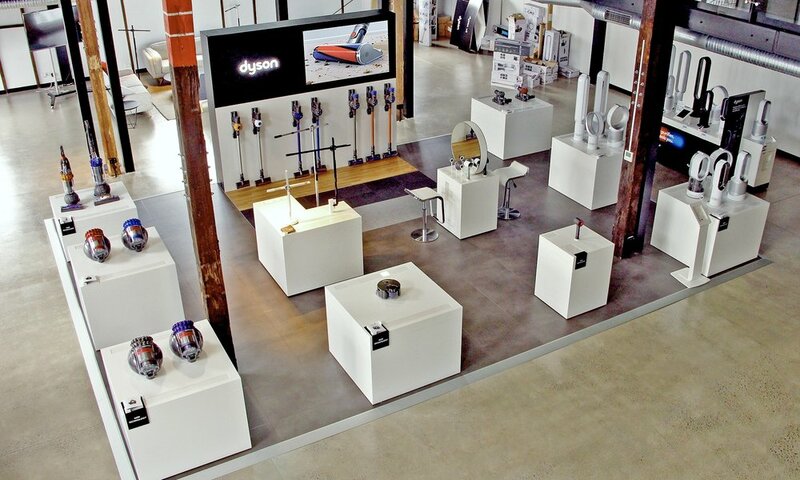 Pixalux® structural light panels were used to highlight the Dyson range. This was very successful with all products, drawing attention to key areas across the product range. Dyson asked us to design the Universal Totem to be a modular display, able to hold the full product range and adapt to any in-store environment. Briefed to hold handsticks only, iDesign came up with a design solution to future proof the unit to showcase all Dyson stock and use the double sided Pixalux® structural light panel as a base panel that could be adapted with a special add on kit to be used as a floating shelf. 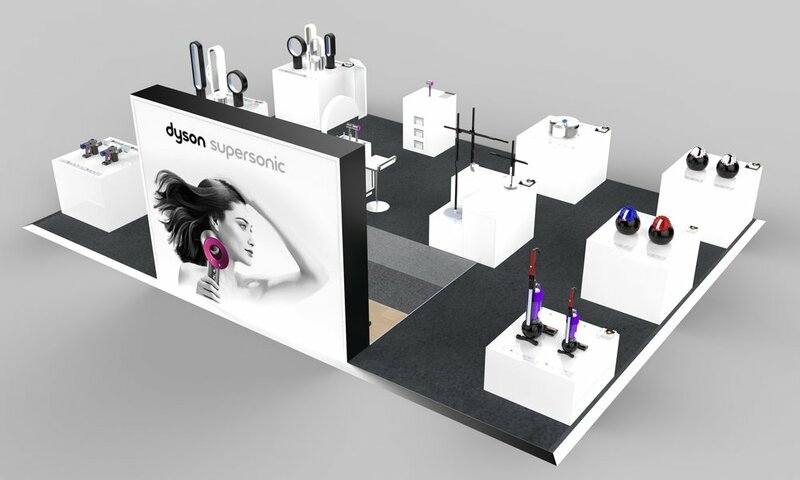 The design allows multiple units to be aligned to make a larger display, this was a perfect solution allowing Dyson to use the multiple displays for “Pop Up” opportunities and urgent retail solutions. The successful design has ensured multiple rollouts over a 3 year period.